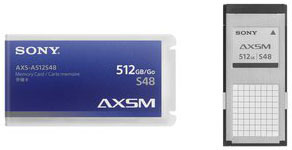 The AXS-A1TS48 AXS Memory (AXSM™) A Series card is an ultra high speed, high capacity and high reliability flash memory media card. It has been designed for the 4K and 2K 16-bit linear RAW format, including High Frame Rate (HFR) recording up to 120fps in 4K resolution* and 240fps in 2K resolution. The AXS-A1TS48 has a capacity of 1 TB and guaranteed write speed of 4.8 Gbps. The card works with the AXS-R7 and AXS-R5 2K/4K RAW recorders and the AXS-CR1 USB 3.0 AXS Memory card reader using the AXS Memory card adapter. * HFR up to 120fps in 4K resolution is only supported by AXS-R7 with PMW-F55. The AXS-A1TS48 has a capacity of 1 TB and guaranteed write speed of 4.8 Gbps. The AXS-A1TS48 has dimensions of 1.38" x 2.95" x 0.31". 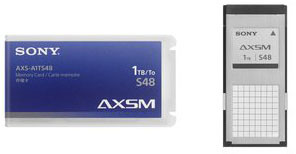 This is smaller and lighter than previous AXS Memory cards and has same height and width dimensions as SxS Memory cards. The AXS Memory A Series uses less power and provides more effective ventilation compared to previous AXS Memory card (AXS-512S24). * 1x AXS Memory card adapter supplied free to all existing and new AXS-R5 and AXS-CR1 customers. Additional adapters are available to purchase. Capacity recordings of 120 min 4K RAW and 470 min 2K RAW at 23.98 PsF, 96 min 4K RAW and 378 min 2K RAW at 29.97 PsF, 46 min 4K RAW and 188 min 2K RAW at 60p. * 4K RAW at 120fps is supported with PMW-F55 only.